Don’t feel like reading? Enjoy this quick video analysis instead. Trumpeted on stage at WWDC, given the Editor’s Choice on release and featured to an unprecedented degree in the Gamers television ad for iPhone 6, no game has seen as strong of a promotional push from Apple as Metal showpiece Vainglory. The fantastic take on MOBA for mobile devices has seen strong reviews and industry support. And yet the game’s performance has underwhelmed relative to the amount of attention garnered. To date, the game has failed to break into the top 150 grossing in the US for iPhone or iPad. In the past three months, Vainglory has not appeared in the top 150 downloaded apps chart in the US on either device. In my work as a game monetization consultant, I’ve encountered teams on all levels of the aggressiveness scale when it comes to monetization. Some have implemented tactics that are far too aggressive and need to be dialed back in order to be more respectful to players. Others, like Super Evil Megacorp, are highly allergic to anything that may be considered manipulative tactics by their players. Yet just because you (rightfully) wish to put respect for your players first and foremost in your priorities, does not mean you should completely ignore those organic opportunities to boost your game’s monetization potential. To that end, I wanted to show 5 monetization optimizations for Vainglory that (I believe) would increase monetization without breaking Super Evil Megacorp’s desire to be the anti-monetizer. 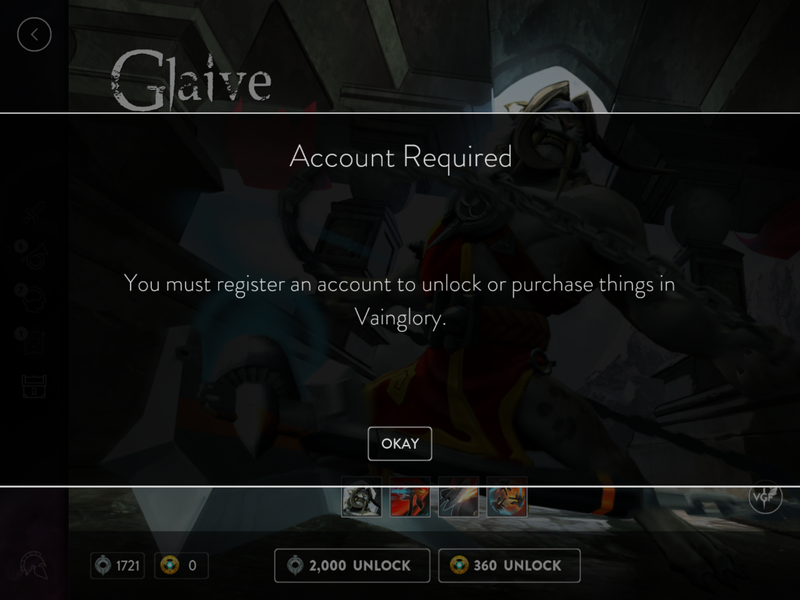 I assume due to its eSports nature, Vainglory requires the player to register an account before they are able to make a purchase in the game. In general, I do not agree with putting unnecessary barriers in front of the ability to spend money, but I will assume Vainglory has its reasons. This implementation of the registration gate provides the most obvious optimization for Vainglory. Instead of “Okay”, this dialog should have two buttons “Register Your Account” and “Not Now.” This dialog puts a gate in front of the player and gives them no way to resolve it. 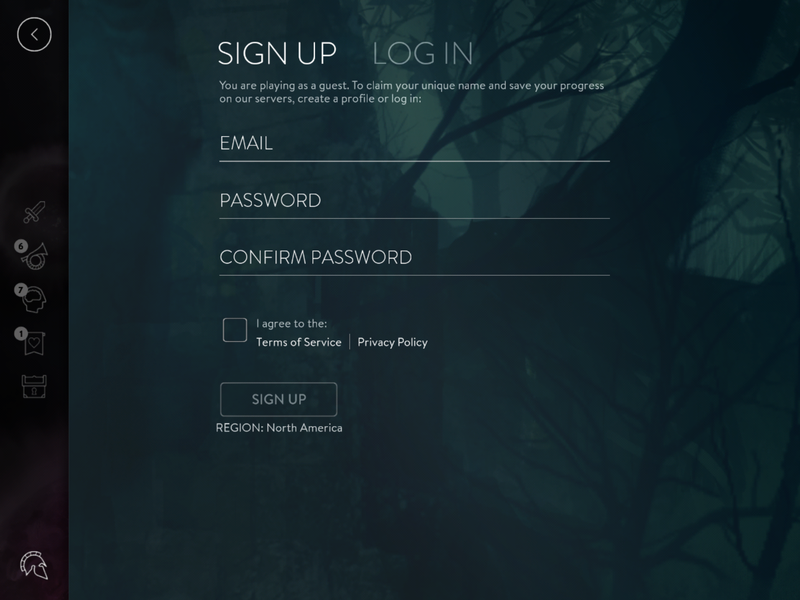 To register an account, they must click okay, exit the store and then find the registration/log in button on the main menu. By simplifying the flow of a player who is trying to make their first purchase, you will increase the percentage of players who complete it. When you ask a player for their contact information, you are asking for the ability to annoy them with email advertisements. In the world of downloadable PC F2P games, sharing contact details in the form of creating an account is often the price of admission for downloading an installer. But on the iOS store, players share their personal details and billing information with Apple so that they do not have to share it with you. If Vainglory is going to require the player to have an account in order to make a purchase, then they ought to incentivize the player for creating that account. Being able to name your account is nice, but no longer being Guest_111714333 on the in-game scoreboard may not be enough of an incentive for players to share their private information. I suggest that the motivation to register an account is sweetened by giving the player either soft or hard currency. This will also allow for a stronger call to action on the registration gate highlighted above as Vainglory would be able to tell the player what they get out of registering an account. Again the purpose here is to increase the percentage of players who register, thereby increasing the number of players who are allowed to make a purchase. As with most MOBAs, Vainglory uses a rotating hero system to drive monetization. Each week there is a selection of heroes a player can use for free. If the player wants permanent access to a favorite hero, they can buy it with soft or hard currency. This screen, where players select their heroes before a match, represents one of the biggest missed opportunities in Vainglory. The greyed out heroes are those who are currently locked. The player cannot even tap them to bring up information explaining why they are locked or how to resolve (which may be a foreign concept for those players new to the genre). 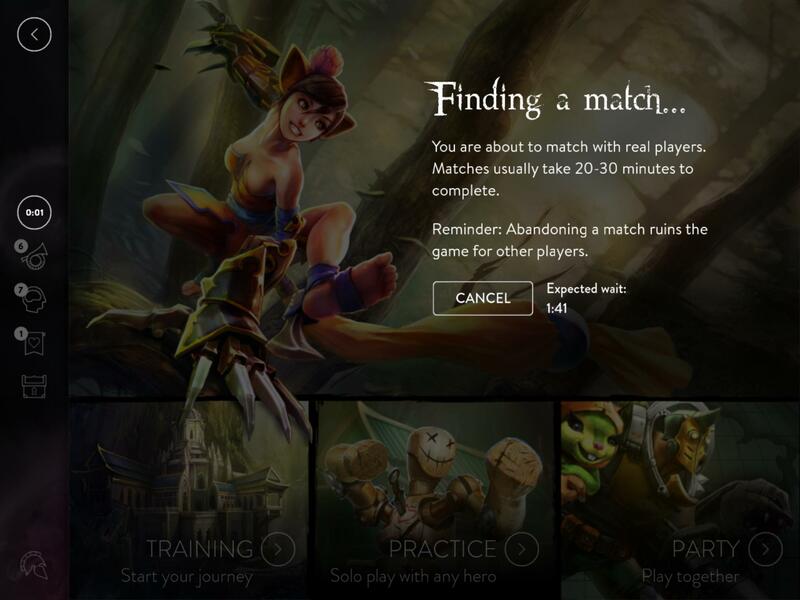 Players spend up to 5 minutes on this screen before each match. They should be able to select any locked hero to see information on it and spend soft or hard currency to unlock it permanently. I can understand not wanting to introduce elements that would slow down the time to get into a match, therefore I would not suggest allowing the player to purchase currency through this screen. However, if a player has enough currency in their account they should be able to unlock heroes through this core loop screen they see before every round of play. This is the suggestion I imagine is most outside of Super Evil Megacorp’s comfort zone. After each hero rotation, the player should be offered a small discount on their most used hero that is no longer available. There are two reasons I am suggesting this feature. The first is that the game does a very poor job of messaging new hero rotations. If a player is new to MOBAs (as I expect a decent portion of Vainglory downloaders are) this may be a completely foreign concept. Additionally, if a player ignores the notification badges on the newsfeed button on the main menu, they may be surprised to find that their favorite hero is no longer available for use. The second reason is that this is the clearest moment of need. The player is most likely to want to purchase a hero right after it goes out of rotation. If the game balances out the “intrusion” of in-game merchandising with a discount, then they are presenting an offer that is meaningful to the player. The system would be fairly simple. After the roster of heroes has rotated, the game identifies the most used hero for each player that is no longer available. 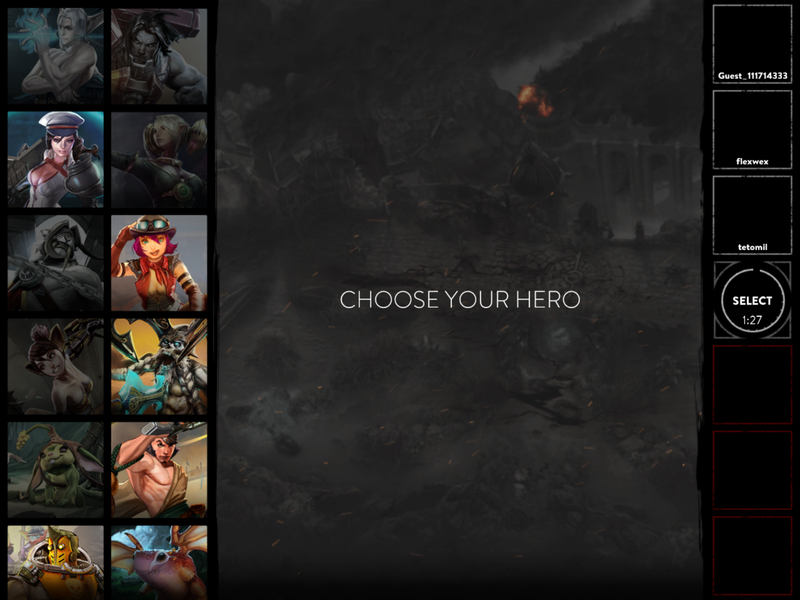 For the next 3 games, a widget on either this finding a match screen or the following choose a hero screen could advertise the offer, where the game could take 10% off the currency price for this hero. This feature would combine making purchasing present in the core loop (and thus more likely to happen) with clearly notifying the player of a change in the hero roster. Vainglory’s current focus is on building community, which in my opinion is not in opposition to the goal of monetization. The two go hand in hand. But for a team oriented genre from a developer focused on community, it is quite difficult to meet other players inside the game. True, I get the occasional friend request from a random who I completed a match with, but why would I want to add a complete stranger to my friends list? And I’m sure that dedicated players are using forums and Reddit to find each other, party up and play Vainglory at a high level. But I, like most players, will rarely if ever visit a mobile game’s dedicated forums. I understand why chat was left out of matches and recent updates have increased the number of tools a player has to communicate easily with their teammates. 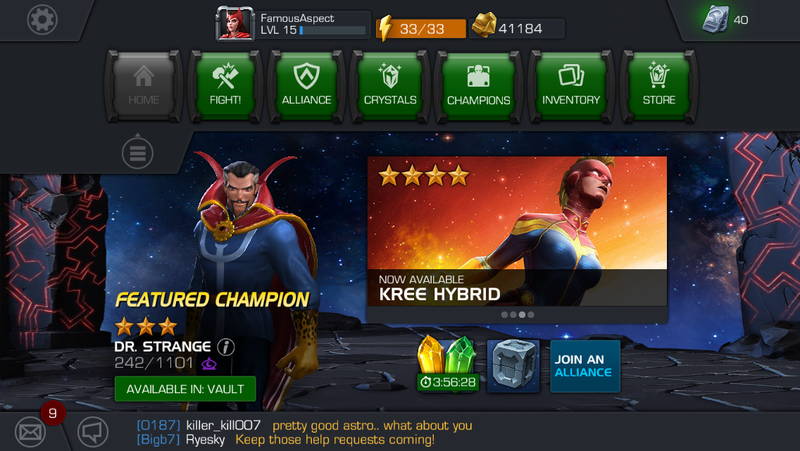 But Vainglory should take a page out of the Marvel: Contest of Champions playbook and add a global chat lobby to the game. Global chat while in the game’s menus would allow players to create the social ties that will build the backbone of community Super Evil Megacorp hopes will give them longevity as a 10-year plus franchise. In my work as a game monetization consultant, one of my key tactics is to separate issues and feature solutions. A developer may say yes or no to a given feature, but so long as they understand why I am proposing it they may come up with a better solution on their own. Whether Vainglory would implement any of the features proposed above or not, my hope is that it illustrates for other developers the issues encountered when free-to-play game goes too far in the anti-monetizer direction. The team at Super Evil Megacorp has plenty of runway to focus on community building and turn a fantastic, fun, critical darling into a financial success. However, one must imagine that neither Apple nor its investors are extremely happy with the game’s performance to date. For Apple, the game was meant not only to sell consumers on the power of new devices, but to also sell developers on why they should adapt Metal and target the high end. And with Vainglory, developers can see a very public example of a game that invested heavily in console quality graphics yet so far has failed to make the impact of a viral hit like Crossy Road. On the investor end, one imagines that the $15 million came from people who buy into Super Evil Megacorp’s long term vision. However, from the outside one imagines that they would not be happy with an investment who has squandered the incredible opportunity presented by their unfair advantage of unprecedented promotion directly from Apple.